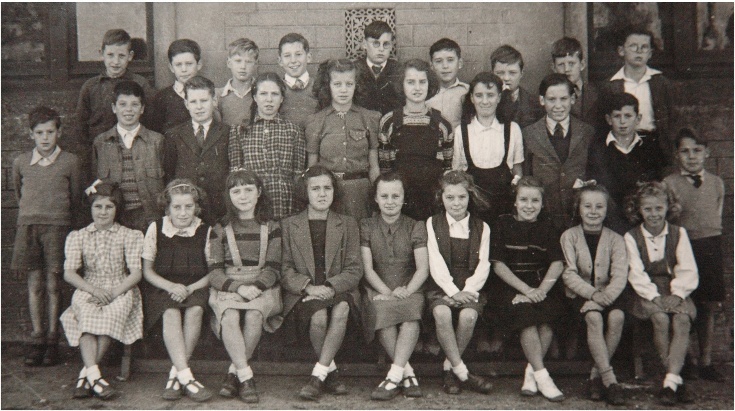 The date and subject of this photograph is not known for certain but is possibly 1949 of Primary 7. Back row left-right: Richard MacRae, Gordon Legge, Billy Sutherland, Billy MacPherson, Frank Hoy, Blank, Ronald Ross, John Cunningham, Alan Campbell. Middle row: John Auchterlonie, Derek Will, Blank, Mary MacAllister, Christine Ross, Ursula MacPherson, ?Julie Ross, Donald MacLean, James MacKenzie, Calum MacKenzie. Front row: Ivy Ross, Mary MacLean, Jean Gibson, Anne Simpson, Kathleen MacKenzie, ?Effie Henderson, ?Janette Graham, Sheila Gordon, Betty Henderson. I knew quite a few in this class. Ivy Ross lived next door to me. Derek is of course Douglas's brother and lived on Shore Rd. Sadly some of them are no longer with us. Gordon, I can remember being in your house a few times, was it you that played the violin? Sad to say that my brother Derek has passed away. He emigrated to New Zealand with his family in the late 1950s. All older than me but some are well remembered. Billy Sutherland, what a nice bloke (as all his family were). I can't pass up the opportunity to ask Gordon what became of Fraser? (Booby). The last time I saw him was about 1970 on a BEA flight from Inverness. I believe he was a barrister and lived in Eton Square (London) at that time. The blank in the back row is Les Fraser, my brother-in-law. I remember Frankie Hoy used to hang out down by the Fire Station when it was down by the harbour. I’m Christine Will, second eldest daughter of Derek Will. Hi uncle Dougie. We moved to New Zealand October 1965 and yes our dad has passed - miss him and mum so much. Dad will be gone 4 years this July coming. Uncle Dougie, it would be great to hear from you - we have contact with the family. My married name is Turner. My mum was Julie Sorby and I can confirm that is her. We visited as kids in the mid '60s and stayed with old Geordie my granddad. She married Billy Sorby in Tain in 1954, then moved back to Glasgow where my dad lived. She had a daughter Julia in 1955, and two boys - myself Iain 1959 and Scott 1968. She passed away in 1994. Does anyone know the Ross’s address back then - would be nice to know if the family home was still there? Christine hi, I have sent a photograph to this site of my marriage to May; in the picture is a very good picture of your Dad in his cadet uniform. I hope that everything at your end is ok and that you all got through the earthquake ok. I spoke to brother Gordon this morning but he could not contact some of you because it appeared that the internet was down. Hope to hear from you soon. Christine, do you have contact with your Uncle Norman? Hi Harry, yes we have all just found uncle Norman - Noddy - he is on facebook. If you are on there you will be able to get hold of him on there. Take care. Regards Christine. Hi Iain, your mother lived at No.4 Outram Street and the house is still there. I was brought up at No.6 and remember your mother well, also the rest of the family. Hi Iain, just to add to Catherine's comment, I lived next door to the Ross's at number 3 Outram Street (the numbers have changed now). I remember them all very well, Dodie, Julie, Ivy, Donty and Kathleen, and of course Geordie himself and Mrs Ross, all fine people. Thanks Catherine, seen the house on google earth street view, I mind a neighbour grew strawberries we were told not to take any by my mum. Been thinking about her life up there before meeting my dad, I can't say she was very happy down here, maybe been better if she had stayed there. Thank you for taking the time to reply. I was in this class and remember most of you; my regards to all of you. Richard Macrae is my oldest brother. I know most of the class. Ivy Ross was a good friend. How the years fly pass. Lovely memories. Betty (Catherine Elizabeth) Henderson later Taylor my mum. Effie (Euphemia) Henderson aunt, still in "Inverg"